After the 2012 elections, women in Washington have a long to-do list—and it doesn’t stop at reproductive rights. Hopes are high that, early on, Congress will pass an inclusive, updated Violence Against Women Act with protections for immigrants, Native Americans and LGBTQ people. The Senate passed a bipartisan bill last year, but the House deformed it and the two versions were never reconciled. The National Organization for Women and others are pushing hard for a vote before March. On healthcare, women’s groups are pleased that the Affordable Care Act banned “gender rating,” the practice by which health insurance providers have charged men and women different premiums, but “disappointed” (some put it more strongly) that the ACA enshrined in law the principle of the Hyde Amendment, the restriction that denies federal funds for abortions and requires women to purchase separate abortion coverage. The groups would also like to see a reversal of the administration’s refusal to grant unrestricted over-the-counter status to the “emergency contraceptive” Plan B, as well as a once-and-for-all repudiation of the Bush-era “conscience clause,” which allows healthcare providers (including pharmacists) to deny women contraceptives at will. Even with a historic twenty women now in the Senate and twenty newly pro-choice seats in the House, it’s hard to imagine the 113th Congress revisiting the thirty-six-year-old Hyde Amendment, but it’s the single move that would make a significant difference for the most women because female poverty is up. According to the National Women’s Law Center in its study of the 2010 Census, the poverty rate among women climbed from 13.9 percent in 2009 to 14.5 percent in 2010—the highest in seventeen years. The extreme poverty rate among women climbed to 6.3 percent, the highest rate ever recorded (with extreme poverty meaning an income below half the federal poverty line of approximately $22,000 for a family of four). The few studies ever done in this area show that lesbian couples and their families are much more likely to be poor than their heterosexual counterparts. Overall, in 2010, 17 million women lived in poverty, including more than 7.5 million in extreme poverty. The number of women younger than 65 without healthcare coverage increased to 19 million, or 19.7 percent, the highest in more than a decade. Around the states, while national polls show that most Americans support birth control and oppose the criminalization of abortion, the last two years have seen a historic spike in restrictions on abortion services. As The Nation’s editors recently noted, “87 percent of US counties lack an abortion provider, and several states have only a clinic or two staffed by a doctor who flies in from another state.” After the Republicans’ Tea Party–fueled victories in the 2010 midterms, state legislatures introduced more bills with reproduction-related provisions in 2011 than ever before: a total of 1,100 provisions, of which 135 were passed by the end of that year. Reproductive justice attorney Lynn Paltrow uses the term “Jane Crow” to describe the widespread “criminalization of pregnancy” that she’s found in today’s United States. A case in point is that of Jamie Lynn Russell, 33, who died in jail this January from a ruptured ectopic pregnancy after police in Oklahoma were called to the hospital where she’d sought help. Russell was arrested for drug possession and locked up after cops found two prescription pills that did not belong to her. Researchers from Paltrow’s group, National Advocates for Pregnant Women, identified 413 similar criminal and civil cases across forty-four states involving the arrest, detention or equivalent denial of women’s basic rights between 1973 and 2005, and another 250 or so since then. While NAPW’s research shows these state interventions are happening in every region and affect women of all races, low-income women and women of color—especially pregnant African-American women—are “significantly more likely to be arrested, reported by hospital staff, and subjected to felony charges.” In the majority of cases, the denial of fundamental rights to pregnant women was done in the name of protecting fetuses. “The question isn’t ‘Are you for or against abortion?’ It’s ‘Do you believe that upon becoming pregnant…women [should be put] in a new category or underclass?’” Paltrow said when the study was announced this past January. It’s exactly the sort of urgent, information-based, motivating question that also needs to be asked about women in the workplace. It’s not uncommon for progressive economists to argue that the country’s economic malaise is related to the growing divide between rich and poor. Inequality holds back recovery, argues Joseph Stiglitz: “To me, these problems are two sides of the same coin.” Even more obviously, rising economic inequality holds back every other kind of equality, including gender equality. Yet feminist advocacy tends to pursue reproductive rights on a separate track from the issues of work, wages and collective bargaining rights. Some groups, however, are making those links. The National Partnership for Women and Families is leading a coalition that is pushing for passage of the Healthy Families Act and an expansion of the Family and Medical Leave Act. The first would allow workers up to seven job-protected paid sick days a year; the latter would expand existing unpaid leave to the employees of smaller businesses and “extended” family members. “The FMLA was an important start,” the partnership says in a written statement, “but the law has significant gaps that leave roughly half of workers ineligible.” It’s not “just” a women’s issue, although women are affected most. That future does not look good. If the Labor Department’s predictions are correct, and some of the fastest-growing sectors of the economy continue to be homecare, retail and food service, more and more Americans are going to be living off the low-paid, low-benefit, insecure jobs that, up to now, women have been left with. In other words, when it comes to work, the new blue collar is pink. Surveying over 2,000 nannies, housecleaners and caregivers in fourteen cities (and nine languages) for a recent study, the NDWA found that the median wage for live-ins was $6.15 an hour. Sixty percent of surveyed workers spent more than half their income on housing, and one in five reported food shortages at home. Sixty-five percent had no health insurance benefits. Of course, legislative gains wouldn’t be so hard to win if poor women had more organized power. A year ago, at a Capitol Hill press conference, surrounded by a dozen women who were either domestic workers or people helped by them, President Obama announced that he was committed to ending the exclusion of these workers from federal minimum-wage and overtime protections. “They deserve to be treated fairly,” the president said. “They deserve to be paid fairly for a service that many older Americans couldn’t live without.” But a year later, domestic workers are still waiting for a final rule that ends their exclusion from the basic workplace protections extended to others under the Fair Labor Standards Act. Even in an election year, the power of women’s groups like the NDWA, and of unions like the AFL-CIO and the SEIU, was not enough to speed the process. The comment period was extended twice (with nearly 75 percent of the comments in favor). A ruling is expected within ninety days. When the Republican leader of the Susan G. Komen for the Cure breast cancer foundation decided to cut funds to Planned Parenthood, the federation’s supporters replaced that canceled $700,000 in a couple of days. Mayor Michael Bloomberg kicked in $250,000. What if we had seen a similar explosion of generosity when Governor Rick Snyder signed Michigan’s new “right to work” laws weakening unions? What if there had been a similar national outcry (instead of a muted gasp) when California’s liberal Democratic governor, Jerry Brown, vetoed AB 889, the Domestic Workers Bill of Rights? Outgoing Labor Secretary Hilda Solis, herself the daughter of a domestic worker, was a strong supporter of extending the Fair Labor Standards Act’s protections. She delivered the keynote speech at the first national convention of Caring Across Generations, a coalition project led by Poo and Sarita Gupta of Jobs With Justice, with AFL-CIO and SEIU support. Her sudden departure strips the cabinet of its strongest supporter of women’s economic rights. Women are 34 percent more likely to be poor than men—and that number has been going up, according to the last census. President Obama signed the Lilly Ledbetter Fair Pay Act, which restored employees’ rights to challenge discriminatory rates of pay, but it left many issues related to obtaining equal pay unaddressed. The Paycheck Fairness Act would strengthen laws against wage discrimination by protecting employees who share pay information with colleagues and by fully compensating victims of pay discrimination. The act was blocked by the GOP last year. The president says he supports it, but he hasn’t fought for it. Meanwhile, he could issue an executive order forbidding retaliation against federal employees who ask questions about one another’s compensation. But he hasn’t even done that. In the end, the single best protection for “choice” is affluence, so reducing poverty would help. In the last three decades, the real value of the minimum wage has gone down. For wage workers today, it stands at $7.25 per hour; for tipped workers, it is $2.13, and women hold two-thirds of those jobs. That’s not enough to make it out of poverty working full-time. Raising the minimum wage to $9.80 per hour, as proposed under the Fair Minimum Wage Act, would boost earnings for more than 28 million workers, nearly 55 percent of them women, and help close the wage gap—and the “choice” gap. Collective bargaining also helps women. 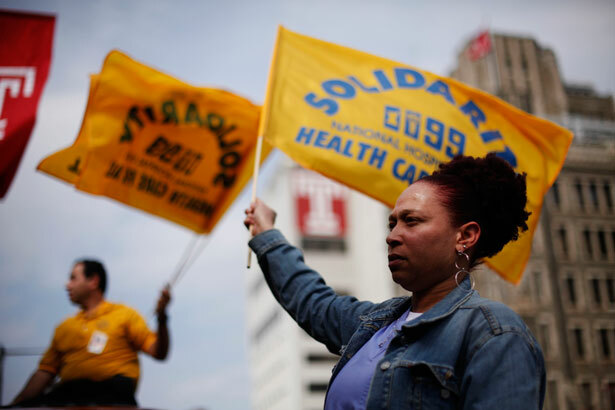 In 2008, the Center for Economic and Policy Research reported that unionization raises the wages of the typical woman worker by 11.2 percent compared with her nonunion peers. Wages are brought into the open in union negotiations. A concerted effort to oppose “right to work” attacks and build union strength for workers would empower more women than a pile of petitions for presidential executive orders. Moreover, as Jane McAlevey describes in her book Raising Expectations (and Raising Hell), given the right sort of leaders, strong unions can contribute muscle and leadership-building savvy to an entire community. That’s good for a world of fights, from healthcare layoffs to school closings to “fetal protection” laws that result in pregnant women being locked up. They might even be able to confront the lingering “confusion,” let’s call it, that in 2012 caused 56 percent of white women to vote for Mitt Romney. Unions did more than any other entity in 2008, and again in 2012, to talk to voters in swing states, white person to white person, about race. That’s what makes victories like the Chicago Teachers Union’s so important. The union is 87 percent female, and a progressive slate of candidates, having built power within their own organization, won the union’s leadership. The members then worked with their community to build a sense of common interest such that when they took on a powerful Democrat, Chicago Mayor Rahm Emanuel, they won what many thought was an impossible fight. As CTU vice president Jesse Sharkey told the smart new journal Jacobin, “We know that we don’t have real friends in high places. So we should stop depending on them.” It’s probably the best advice anyone could give the women’s movement. Editor's Note: This piece originally stated, "Fifty-five percent of women (including 96 percent of African-American women and 67 percent of single women) voted for President Barack Obama this past November." These statistics refer to women voters, not women in the general population. We have corrected the text to reflect that.